A cold water supply tank. 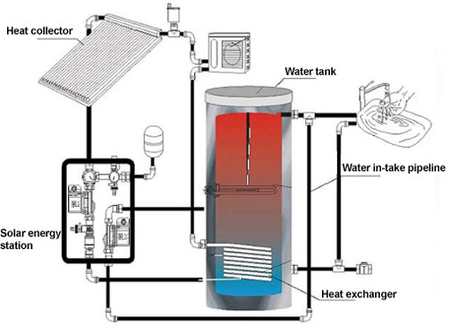 A solar water heater works by using the energy from the sun. The rays of the sun after penetrating through the toughened glass fall on the absorber where it is absorbed by the cold water. Thus, the temperature is increased. The hot water is then collected in the insulated storage tank. The collection of hot water is done either through the thermal siphon system or by the forced flow system. The temperature of the water can be raised up to 85°C. One particular thing is that the working of solar water heating system depends on radiation and not in direct sunlight as a result of which it can also work on dull days. Solar water heating systems are required in domestic, commercial and industrial sectors. This method is used to save energy, to provide light and warmth. It serves the hot water when there are electricity breakdowns. It lowers the cost of electricity. The solar water heater helps to reduce the emission of carbon dioxide into the atmosphere and thus can be used to check global warming. It also contributes to reducing the emission of other greenhouse gasses. Clean energy is produced by this system. There is less risk of accidents compared to the conventional water heating system. With the use of the solar water heating system the burning of fire woods, coal, etc. can be reduced which results in decreasing the amount of degradation from the environment. Firstly before installing a solar water heating system there must be plenty of sunshine almost throughout the year. One should make proper arrangement before buying a solar water heater. There should be an availability of ample unshaded spaces either on the ground or on the roof. One should check the load bearing capacity of the slab while installing the solar water heater on the roof. The solar water heating system must be south facing. While operating the pump the electricity should be in the forced flow system. 1) Active solar water heating system. 2) Passive solar water heating system. a) DIRECT- CIRCULATION SYSTEMS: Here pumps are used to circulate pressurized potable water directly through the collectors. b) INDIRECT-CIRCULATION SYSTEMS: Here the heat-transfer fluids is pumped through the collector. a) INTEGRAL-COLLECTOR STORAGE SYSTEMS: This system consists of storage tanks that are placed in an insulated box. These solar water heaters are suited for areas where the temperature rarely goes below freezing. b) THERMOSIPHON SYSTEMS: The mechanism of this system depends upon the convection of warm water. As the water is heated, it becomes lighter, rises upward while the cooler water flows down the pipes to the bottom and thus circulation is continued. Making sure you have an available are of unshaded space either on the ground or on the roof beforehand is excellent advice. Having everything prepared for the solar installation would be important in making sure you get everything ready for your hot water system. I would imagine that you would want to make sure to find the best system to get your solar power, and you’d want to make sure they work well in your area before your purchase. New innovations that combine the benefits of Solar plus the efficiency of Geothermal Heat Pumps have been growing in popularity. One reason is they produce day and night because of the hybrid ability to be a Solar Heat Pump.